It’s insane to think that one of the most popular heating systems in the nation is the gas furnace. The idea of piping gas into your home and then lighting it on fire to create heat is pretty bizarre. Of course, no one thinks of it that way because gas furnaces are incredibly safe—when installed correctly. A lot of things can go wrong with gas lines, and it takes a trained professional to work around them. And we don’t just mean during installation or repair. It might be days later when you discover that a lapse in your craftsmanship is responsible for a major gas leak. We wouldn’t suggest that you do a DIY repair on an air conditioner either, but at least with an AC, you aren’t dealing with heat. The presence of gas burning components makes a faulty repair so much worse in the event that they cause an accident. Gas lines are one thing, but there’s also the risk of carbon monoxide leaks and house fires. Give yourself peace of mind by recruiting an expert on heating repair in Corona, CA. 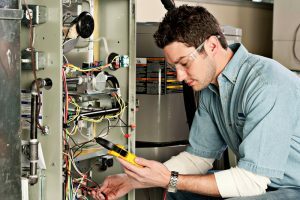 You don’t have to be working on electrical components or even working on an electric furnace to face the risk of electrical hazards. Something as simple as a shorted wire can create conditions for electrocution from touching the wrong part of an HVAC system at the wrong time. An HVAC pro knows to take precautions like turning off the power or checking metal components with non-contact voltage detectors. The average homeowner simply isn’t trained with the foresight or proper tools to handle these risks. Sometimes parts break, and it’s the manufacturer’s fault. They are willing to compensate you for them as outlined in their warranty. That can be the difference between paying for a brand-new heater or not. However, if you were to try and fix this problem on your own, you will most likely void this warranty simply on the basis that you’re not a licensed professional. The exact details of every warranty vary, but many of them have strict policies that the average homeowner is capable of violating, whether on purpose or by accident. If you need furnace repairs, don’t bother with DIY. Contact RKM Heating and Air Conditioning today to schedule a service.